Watermelon, cucumber, red onion, and jalapeno come together for a flavorful and refreshing twist on a classic salsa. Serve with chips or over fish, beef, and chicken. 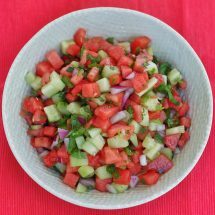 Combine watermelon, cucumber, onion, jalapeno, cilantro, mint, and lime juice in mixing bowl. Season with salt. Refrigerate for at least 30 minutes to let the flavors meld.